The small carpenter bee, Ceratina (Neoceratina) dentipes, is an invasive species throughout the South Pacific and has been identified as one of three alien Ceratina species established in Hawaii. Invasive bees are thought to be exacerbating declines of Hawaii’s native yellow-faced bees (Hylaeus) but, outside of the honey bee (Apis mellifera), relatively little empirical work has been done to track the origins and avenues of introduction for these species. 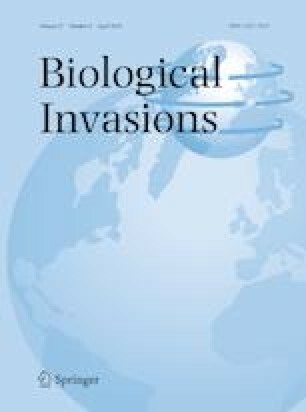 Extant research addressing C. dentipes is limited, but suggests that it is a rapidly moving invasive, morphologically similar to both native and non-native bees within its introduced ecosystems, and may be capable of parthenogenic reproduction. Ceratina dentipes thus represents a potentially serious conservational challenge for terrestrial ecosystems throughout the Pacific. Here, we perform the first comprehensive phylogeographic assessment of C. dentipes, drawing from invasive populations across Hawaii and the South Pacific, and from native populations in Southeast Asia. Bayesian phylogenetic reconstruction and analyses of molecular variation both indicate that C. dentipes is very recently introduced in Hawaii. Analyses also reveal that invasive populations of C. dentipes likely originated in Borneo or mainland Southeast Asia before being widely and rapidly dispersed, most likely through anthropogenic transport. The online version of this article ( https://doi.org/10.1007/s10530-018-1892-z) contains supplementary material, which is available to authorized users. We thank Sam Droege, Quinn McFrederick and Laurence Packer for providing specimens; and Erika Tucker for performing species taxonomic identifications. This work was made possible through funding from the University of New Hampshire and the New Hampshire Agricultural Experiment Station to SMR.